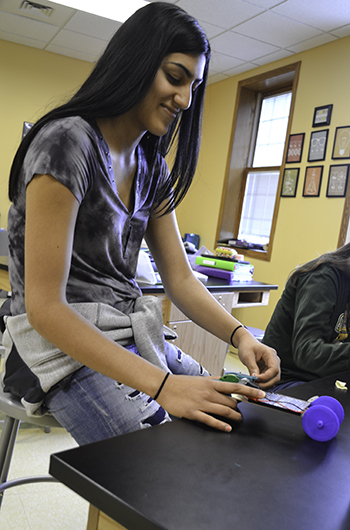 An eighth-grade student is working on building her solar car. 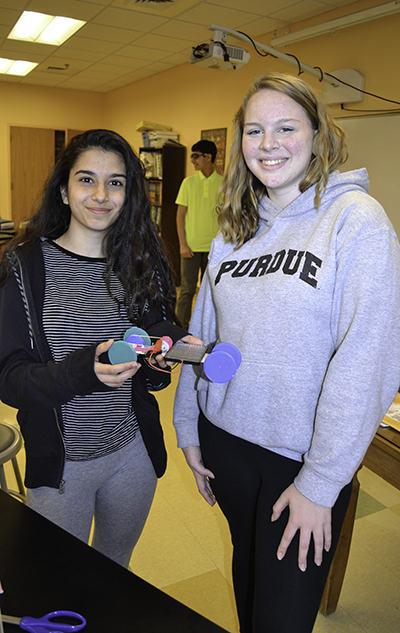 After spending weeks designing solar cars, teams of eighth graders at University Laboratory High School in Urbana and Next Generation School in Champaign tested their cars to see if they would move when exposed to bright light—then were either exultant or chagrined based on the results. The project was part of the POETS’ RET program, during which a team of four local science teachers was tasked with creating a multi-week curriculum unit related to power, heat, and power density that was aligned with Illinois’ Next Generation Science Standards (NGSS). The teachers, Uni High’s David Bergandine and Sharlene Denos, Next Generation School’s Bryant Fritz, and Centennial’s Jay Hooper, were part of a multi-year effort to create an extensive unit. 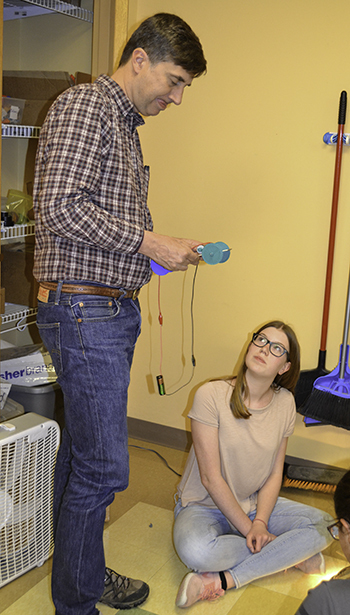 According to Joe Muskin, Education Coordinator for the NSF-funded POETS (Power Optimization for Electro-Thermal Systems) Engineering Research Center, the spring 2017 classroom testing at the two schools represented the first tests of some of the unit. After testing it in Denos’ class, modifications were made based on the outcomes, then it was re-tested in Fritz’s class. Joe Muskin helps a student test her team's solar car. This summer, POETS’ RET teachers (some returning, some new) “will refine the solar car module and add to it with new material as the entire multi-week curriculum is fleshed out,” Muskin explains. However, to get to that point, the process didn’t always go smoothly. For example, the motors didn’t produce enough torque to propel their cars with the limited light in the classroom. To generate enough torque to get their cars to move, they had to design a gearing system and print it on 3D printers. “They had to run some tests and calculate the gearing ratio they would need, then design a system to give them the needed torque,” Muskin explains. A Uni High student tests the solar battery she's working on for their solar car model. Since the lesson was first tested at Denos' class at Uni High, while students learned a lot, some of what they learned was through failure. 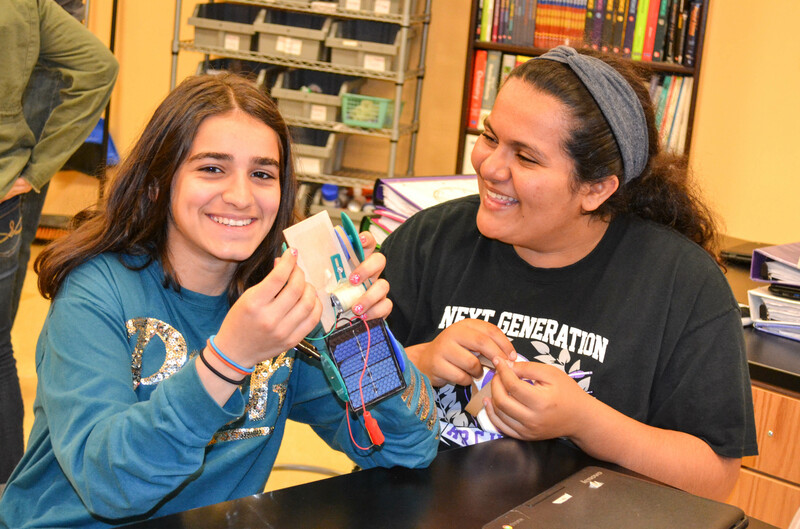 "Overall, I believe the lesson taught at NGS was much better organized and efficient, based on a great deal of troubleshooting my students did," she acknowledges. "That is one of the many benefits of working with Uni High teachers and students. We have the flexibility in our curriculum to experiment with projects like this and our students understand that it may not always work out perfectly. In this case, I believe the students learned much more from all the ways in which the car didn’t work. Students here are encouraged to take risks, which sometimes pay off, as with the multiple solar-panel limo, and sometimes do not, as with the cardboard, direct drive “racer." Uni High students work on their solar car model. In some of the comments Denos' students made regarding the lesson, they confirmed that while they had learned a lot, they also learned through failure. For instance, one students said, "I learned what repetitive failure feels like, and I also learned how to operate the type of 3D printer that we used. I also learned more about friction, torque, and efficiency." The same student also indicates: "I think I learned many things while working on this project. I learned to be patient especially when my wheels kept on turning out to be unsuccessful, and I tried not getting mad at everything that didn't go my way—for example like the rubber bands weren't the right length." 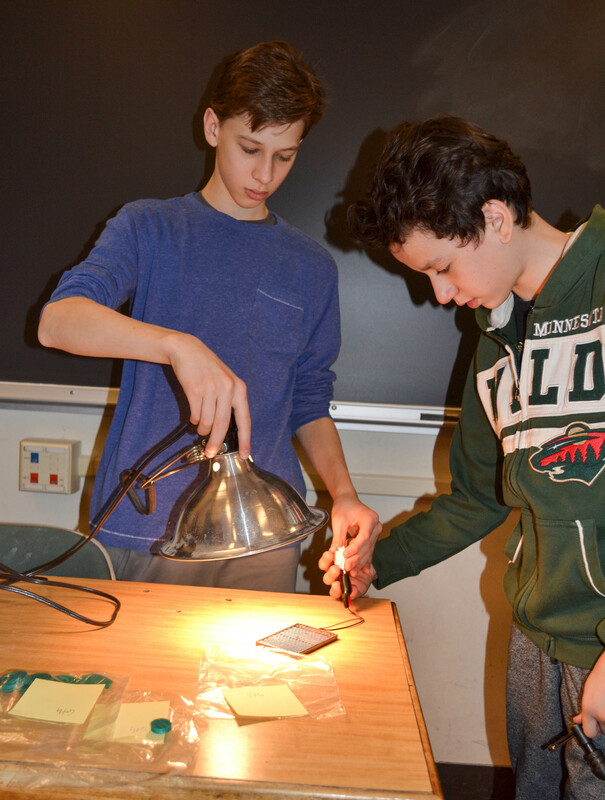 Uni HIgh students test solar car components under a bright light. A plan for further development and testing of the unit is in the works, to not only do it again in these schools, but to expand the development of the unit in the coming year to Champaign and Tuscola schools as teachers from those schools do the summer development then test in the coming school year..
Also, according to Muskin, teachers at POETS’ partner universities, Arkansas, Stanford, and Howard, will be helping to develop components for this extensive middle school curriculum. Bryant Fritz helps his students test their solar car under a light. Fritz indicates that for his students, the unit provided “just the right amount of challenge for them. They definitely learn throughout the entire time that engineering is a process of redesigning and refining and continuing to change things and solve problems as they go through the whole process. They definitely had their frustrations and they’ve learned that if they want to be successful with this, or in engineering in general, that they have to find ways to troubleshoot those things." NGS eighth graders, Hadi Ahmad and work on their team's solar car. Uni High science teacher Sharlene Denos works with her students on their solar car. An NGS eighth grader, Tabeeb Khandaker, works on his team's solar car. Briana Bellard says she and her teammates, “learned a lot about how the gears function and how they work together. I feel like that was a big component of that. Learning about how to code and program stuff was really big too.” She learned to code in order to print in 3D. Bellard shares that as a result of this experience, she would most definitely pursue engineering. An NGS eighth grader works on her team's solar car. According to Banan Garada, the most challenging part was “probably trying to find the right wheel that wouldn’t fall off. Because a lot of the wheels kept falling off from it.” While they 3D printed the gears, the wheels were already printed for them. As with many of the other students, Muthekepalli learned that engineering requires persistence. “It takes more than one try," she acknowledges. "You just need to keep on trying. It doesn’t come easily. Sometimes you just have to ask for help, even if it hurts your pride a little bit. "However, she evidently enjoyed it, because she says she will most likely end up pursuing engineering. Two NGS students show off their solar car. Story by Elizabeth Innes, Communications Specialist, and Ashely Chung, undergraduate student, I-STEM Education Initiative. Photographs by Elizabeth Innes. Two NGS eighth-grade students working on their solar car.